CKF team is glad to let everybody know that we are sponsoring the education of a blind student named Venkalamoorthy. 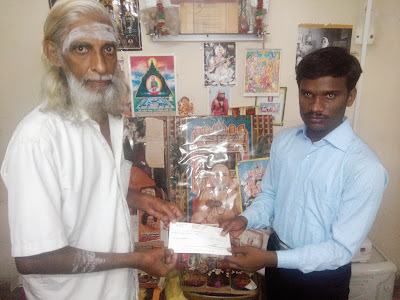 This Activity is a joint project by CKF with 'Nilacharal Ashram'. Venkalamoorthy is an aspiring student who is doing his B.Ed. and wants to be a professor. We are glad that we are able to help him pursue his dream. We extend our thanks to our sponsors, who have helped Venkalamoorthy. Also, we will be glad to help him continue his education in the future based on the need. Please feel free to reach out to computer.kindness@gmail.com for more details. Thanks for your continuous support.